The sale of Herbal Products has become a large and lucrative project for the Museum (probably the largest of its income-producing activities) and has developed into quite an industry as the popularity and demand of - particularly the medicinal herb products - from Montagu are steadily on the increase each year. It is a special day for the museum to be able to say it now has its own wheels to assist them in their task! 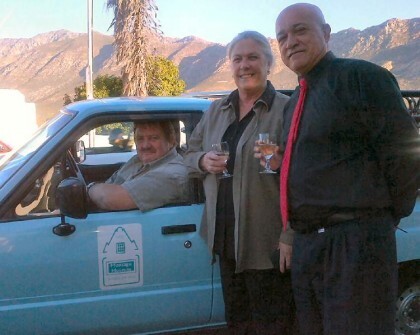 Seen celebrating and toasting the arrival of the bakkie, are the Museum's Board of Trustees Members : Jacques Kriel (seated), Ronel Preston (centre) and Chairman of the Board, Clarence Swanepoel (right).